There’s alot of interest surrounding this film so I thought I would talk about it. 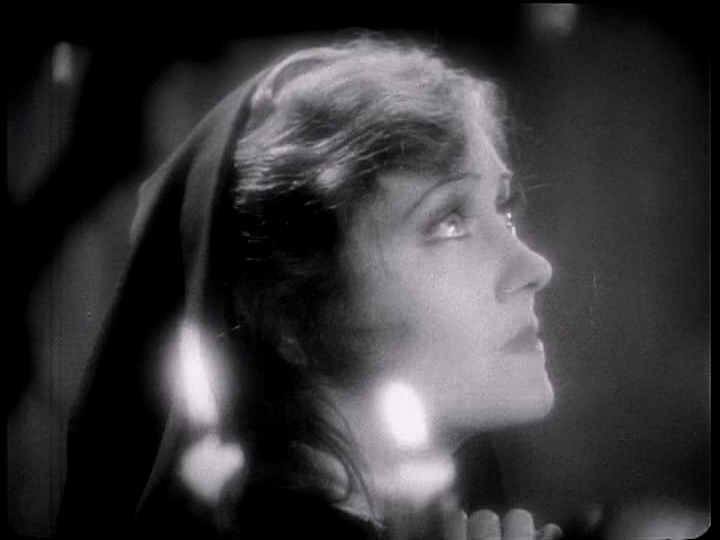 When I first saw Sunset Boulevard I noticed the silent film clip that was shown by Norma Desmond. I went online and searched for the film and found that it was a notorious film among silent film fans. So I rented it and it started my interest in Gloria Swanson and silent film for that matter. 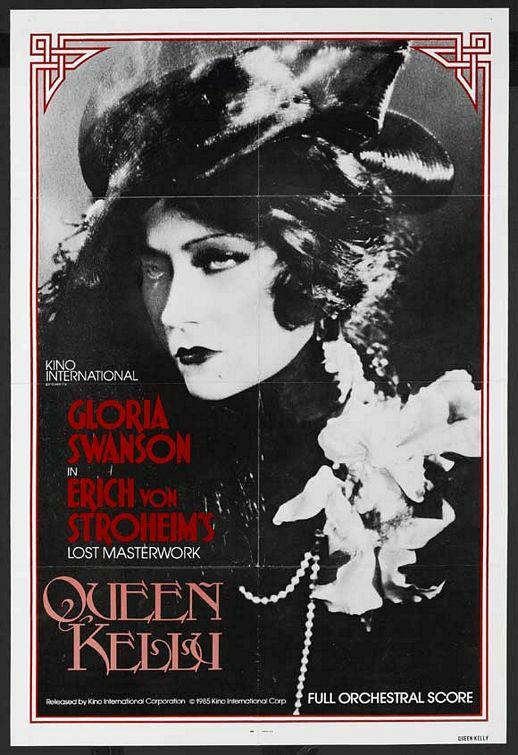 Queen Kelly was the biggest failure of Gloria Swanson’s film career. At this point she was producing her own films since she moved to United Artists after turning down Paramount with their $25,000 a week offer. She wanted to be able to choose her directors and material and so forth and seemed like a wise decision. Her first film out on her own The Loves of Sunya wasn’t a hit but she made up for it with the film Sadie Thompson, my personal favorite, even earning her an Oscar nomination. Queen Kelly was next. Around this time Gloria was having an affair with Joesph Kennedy. They both started working together in the film industry and wanted a vehicle to collaborate on. They were both intrigued by a brillant director, Erich Von Stroheim. His most famous films include Greed and The Wedding March. So, they met with him and he thought it would be a great idea. He had a story already in mind called The Swamp. Gloria and Joe were both intrigued by the story and went right ahead with it. Scene was shown in Sunset Boulevard. Filming began in November of 1928. The title The Swamp was changed to Queen Kelly since The Swamp wasn’t a very appealing name. Von Stroheim was a perfectionist. He would shoot and reshoot and shoot and reshoot scene until they were to his liking, often going over budget and over time. For scenes he would use real furs, real pearls, real caviar. It all had to be real. Gloria was concerned about the money he was spending but Joseph Kennedy didn’t seem to say anything about it so she just shrugged it off and thought he was trying to be like the great Cecil B DeMille. Filming continued through December and January. Filming was going very slow due to how meticulous Von Stroheim was. Gloria became concerned it wouldn’t finish in time. When Gloria reported to set one day she noticed that the script said that the current scene was to be taken at a dance hall. Well, when she arrived she noticed it was more like a brothel. Since Von Stroheim is notorious for doing his own thing, they actually hired two people just to watch him and keep him on track, obviously they weren’t there that day. This particular morning Von Stroheim was instructing fellow co star Tully Marshall on how to dribble tobacco juice onto Gloria’s hand while he was kissing it. Gloria was disgusted and stormed off the set to her bungalow and called Joesph Kennedy right away telling him this film would not be finished and would end up on the cutting room floor. Queen Kelly ended up not being finished. Although Gloria did reshoot scenes and make a whole new ending but it never got complete and was not released in the US, but in foreign countries in 1930. It was finally released in 1985 by Kino with film stills in the parts that were missing. Gloria made up for the loss with her next film The Trespasser which was a huge hit. Like I mentioned before a clip of the film was shown in Sunset Boulevard which ironically also co starred Erich Von Stroheim as Max who runs the film for Norma. At the time of Sunset Boulevard they placed their difference aside. All in all I think it is an interesting film and is considered to be one of the best silent films of all time. It had alot to do with my start in silent film and love for Gloria Swanson. Queen Kelly is now available on DVD through Kino. What a year for film! What a year for movies. All time favorites such as The Wizard of Oz and Gone With the Wind were both released in this great year of film. The year 1939 is said to be by most film historians as the greatest year in film of all time. With just Oz and GWTW the year is already great but let’s take a look at the other marvelous films from amazing year. Movie audiences were quite spoiled this year! MGM, the king in the studio systems, was the leader in film every other year so it is no surprised they turned out great movies in this year. So, you will notice MGM is quite represented here. But the other studios seemed to also go all out for this year. Everyone did nice work. I hope you enjoy the spam! The Women had a stunning, talented cast as well as a great director, George Cukor. Since he was removed from directing Gone With the Wind he was available to direct this. And who else really could have? Cukor was great with female driven films such as The Little Women. The film stars the queen of the MGM lot and recently widowed Norma Shearer and her rival Joan Crawford, as well as the great Rosalind Russell, Paulette Goddard, Joan Fontaine, just to name a few! It is the ultimate catty, bitchy, gossipy film and it is great for it. And what other studio could have made this? No one but MGM. Let’s take a break from MGM and get into some of Warner Bros. films. MGM was glamour and sparkle, WB was tough and gritty. The reining queen of the WB lot was Bette Davis. Among all of the gangster and crime films Bette made women’s pictures. She turned out four great films in 1939 that honestly any actress would be lucky to have in their whole career. The films were, Dark Victory, The Old Maid, The Private Lives of Elizabeth and Essex, and Juarez. Dark Victory is in my opinoun Bette’s best film. They didn’t think people would want to see a film where the star dies, they saw it as too depressing but they were proved wrong with Bette’s amazing performance. The death scene was not depressing but touching and peaceful. This years really marked the range Bette had and how amazing she was. William Holden always talked great about Barbara Stanwyck after the filming of Golden Boy. He was new to films and wasn’t really doing well with this one so Stanwyck would privately help him out with his acting by giving him tips and he improved muchly. She even threatened to walk off the film if they got rid of Holden. So, because of that he always praised her. When she passed away, Holden would place flowers on her grave every year after she died for a while. Golden Boy is a nice little movie with the great Barbara Stanywck and a young curly haired William Holden. What can be said about Oz that hasn’t already been said. This is a great classics that continues to be immensely popular even 70 years after it has been filmed. Gone With the Wind, yet another amazing classic and epic film. I watched this as a kid and recently rediscovered it a few years ago and it got me started on my interest in classic film. This years marks the 70th anniversary of all of these amazing films. Even though they are 70 years old they still live up today as great films in cinema history. Turner Classic Movies did a documentary on this year which you can buy on the Blu Ray set of The Wizard of Oz or catch it on TCM . Hello and Welcome to The Studio Era! I’ve been wanting to do a blog about old hollywood for a while now and I finally got around to doing it! I now just hope there is someone out there that will want to read my ramblings! lol This blog will feature movie reviews, news pertaining to classic film, and all the wonderful stars from the golden age. Thank you for stopping by and make sure to bookmark us!